If you were to ask me what my favorite iconic moment in Black History is...I wouldn't answer with words. Instead, I'd hold my fist up high in the air, back straight, head up. To me, there's nothing more powerful, more sacrificial, more iconic than the Black Power salute by John Carlos and Tommie Smith. They were the Colin Kaepernick, the Mahmoud Adbul-Rauf, and the Muhammed Ali if you will, of their day. 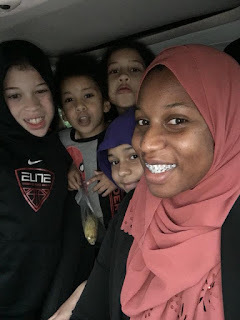 To honor the photoshoot I recently did for this website, Black Muslim Women Matters, I wanted to write briefly about the history of that iconic photograph that is often duplicated but rarely understood. 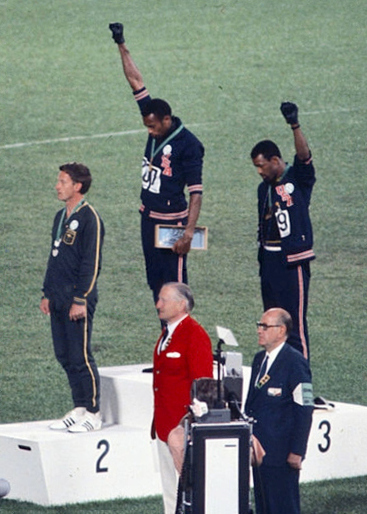 Unfortunately, many people today have no idea why Tommie, John and Peter Norman chose to protest in such a visible way, during a volatile time in American History. In their own words, "Smith said he had raised his right fist to represent black power in America, while Carlos raised his left fist to represent black unity. Together they formed an arch of unity and power." In addition, the accessories they put on also made a statement. As they ascended the podium, Carlos and Smith wore "black socks and no shoes to symbolize African-American poverty, a black glove to express African-American strength and unity. (Smith also wore a scarf, and Carlos beads, in memory of lynching victims.) As the national anthem played and an international TV audience watched, each man bowed his head and raised a fist." Here's another little known fact, Peter Norman, the third place sprinter, along with Smith and Carlos wore a badge on their jackets with the OPHR logo. OPHR was a unsuccessful boycott of the Olympics by Black athletes until specified conditions were met. Peter, from Australia, identified with this cause due to the inhumane treatment of Aborigines or Native Australians due to the Whitening of Australia Policy. All three men were ostracized when they returned to their own countries and Smith and Carlos were both referred to as "Black Storm Troopers". The wording is so very ironic considering the controversy that John Boyega caused as the first "Black Storm Trooper" in Star Wars 7 recently. In any case, it's important to remember this history in light of what is currently happening to Colin Kaepernick who chose to protest during the national anthem to shed light on the plight of people of color in this country. The media and the Orange man want to make it about the flag, they want to make it about a racist song, they want to make it about the NFL and the military. 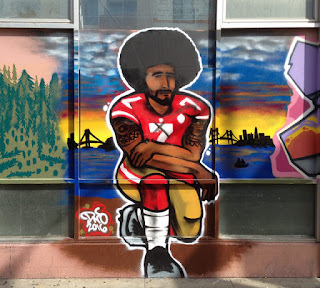 At the end of the day, Colin began this protest to highlight economic inequality, police brutality, an unequal justice system, and other ailments that disproportionately affect people of color in this country. Conservatives, wayward Liberals and the media can try to shift the message all they want but we, the Black delegation, can't let it become diluted. As for Colin, well, he may lose everything now, but his legacy if history is an indicator, will be counted amongst the greats who did it before, Smith, Carlos, Ali, and Abdul Rauf to name a few. And...because this is a blog about Black women....I would be remiss to not point out the brave sistas at the forefront of this protest. 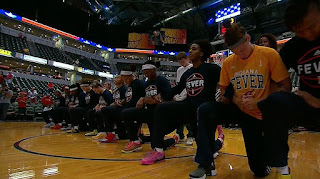 Shout-out to the WNBA and the Black Women that have continuously protested the national anthem, promoted Black Lives Matter, and stood up to their league when fines were imposed for well over a year. Yal the real MVP's. History may not be as kind to you as they are to the men, but such is patriarchy. We see you though Queens, keep pushing!